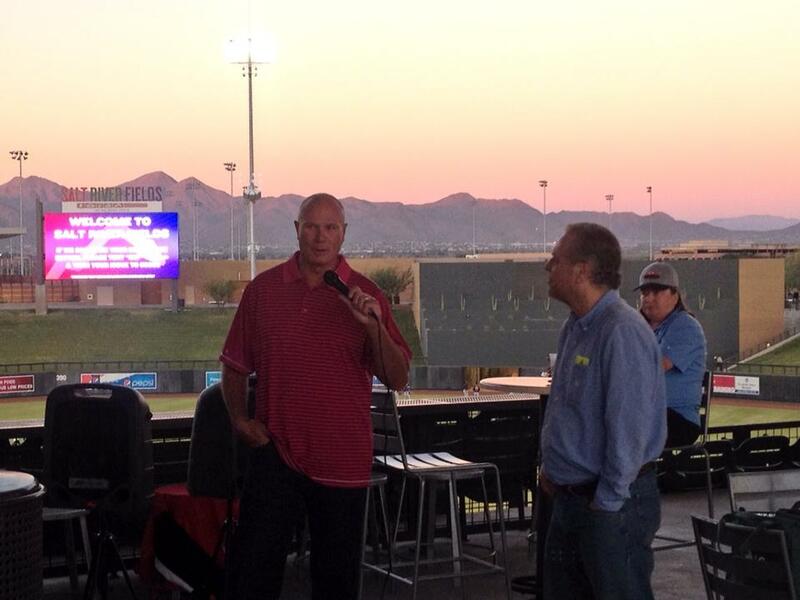 The fifth annual SABR Arizona Fall League Conference was held October 31-November 2, 2013. The conference featured four AFL games at three different ballparks. Guests saw five of the six AFL teams, showcasing nearly every major league team's top prospects. The final game on Saturday night was the Fall Stars Game at Surprise Stadium. After taking in a game on Thursday afternoon, guests were treated to dinner at Don and Charlie's, home to one of the great sports memorabilia collections you will ever see, with former major leaguers Lou Klimchock, Ron Davis, Dave Hilton and Ken Phelps, along with AFL founder Roland Hemond. Friday's schedule included two AFL games and a pregame ballpark dinner at Talking Stick at Salt River with special guest speaker Mark Davis (right), 1989 National League Cy Young Award winner and now a minor league pitching coach in the Kansas City Royals organization. Davis spent 15 years in the major leagues with the Phillies, Giants, Padres, Royals, Braves and Brewers. On Saturday morning, attendees joined members of SABR's Flame Delhi (Arizona) Chapter for their regional fall meeting. Saturday night is always a highlight of the conference as the top prospects from every organization participate in the AFL Fall Stars game. The Arizona Fall League (mlbfallball.com) is baseball's premier player development league. In the first four years of the conference, attendees were treated to sneak peeks at Mike Trout, Bryce Harper, Buster Posey, Stephen Strasburg, Nolan Arenado, Gerrit Cole and Billy Hamilton before they hit the big leagues. All baseball fans are welcome to attend the SABR Arizona Fall League Conference. 10:00 a.m-12:30 p.m.: Flame Delhi Chapter Meeting at Holiday Inn Express. Guest speakers: Barry Bloom and Bernie Pleskoff of MLB.com, Seattle Pilots historian Charles Kapner. 12:30-3:15: On your own for lunch or to explore the shops of Old Town Scottsdale; free hotel shuttle available.